The see-through design provides an effective and affordable waste management solution for high security areas. Ideal for airports, train stations, bus stops, buildings and schools. 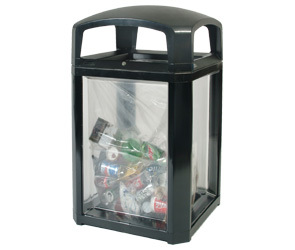 These 50 gallon waste receptacles are engineered for superior durability and a reassuring permanence. The solid resin constructed frame won't fade or dent. The stay open strap and hinged hood allows for easy servicing of the can liner retainer band. Complies with Department of Homeland Security Directive SD RAILPAX-0401. Constructed of durable, chemical resistant, engineered polymer. These Landmark Series® Security waste receptacle kits are available with several versatile options designed to suit your needs. The following is the easy 2 step ordering process instructions. (B) of Landmark Series® complete waste receptacle kits you would like to order. * Model 3975-89 (50 gallon Dome Top with Lock), will appear all as a single line item.